19/30 City/Highway MPG, Sport Appearance Package with 20-inch black noise aluminum wheels, dual rear exhaust with Bright Tips, acoustic windshield and front door glass, leather-wrapped steering wheel, cloth high-back bucket seats, satellite radio, Uconnect 4C with 8.4-inch display, Apple CarPlay and Google Android Auto, integrated voice command with Bluetooth, ParkView rear back up camera, remote keyless entry and traction control. NEW VEHICLE WARRANTY: Every Chrysler, Dodge, Jeep and Ram vehicle purchase includes a 5-year/60,000-mile powertrain limited warranty and a 3-year or 36,000-mile basic limited warranty. Ram diesel trucks carry a 5–year or 100,000–mile powertrain limited warranty as well as the 3–year or 36,000–mile basic limited warranty. Fiat brand vehicles carry a basic and powertrain 4-year/50,000 miles warranty. Terms and conditions of warranties vary by brand and vehicle, please see Anderson Chrysler for complete details. Warranties may be restricted or denied if your vehicle or part has been modified, improperly maintained or removed. WHY BUY FROM ANDERSON: All Anderson pre-owned vehicles include a one-year/15,000 mile (whichever occurs first) vehicle maintenance plan when the vehicle is serviced at an Anderson Auto Group dealership. Out of town customers will be accommodated with free shuttle service from Las Vegas and Phoenix airports and if an overnight stay is needed, discounted nightly rates are available from local hotels. We welcome you to come in and enjoy a positive buying experience and look forward to you joining the Anderson family of customers. DISCLAIMER: *Prices, options, specifications and images shown are subject to certain qualifications and availability. Pricing information is not final and may not include taxes, registration, finance and purchase fees. Please confirm vehicle availability, pricing and warranty information by calling us at 928-764-5153 or emailing our internet sales department at chryslersales@andersonauto.com. Recent Arrival, 19/30 City/Highway MPG, Sport Appearance Package with 20-inch black noise aluminum wheels, dual rear exhaust with bright tips, acoustic windshield and front door glass, leather-wrapped steering wheel, cloth high-back bucket seats, satellite radio, Uconnect 4C with 8.4-inch display, Apple CarPlay, Google Android Auto, integrated voice command with Bluetooth and ParkView rear back up camera. NEW VEHICLE WARRANTY: Every Chrysler, Dodge, Jeep and Ram vehicle purchase includes a 5-year/60,000-mile powertrain limited warranty and a 3-year or 36,000-mile basic limited warranty. Ram diesel trucks carry a 5–year or 100,000–mile powertrain limited warranty as well as the 3–year or 36,000–mile basic limited warranty. Fiat brand vehicles carry a basic and powertrain 4-year/50,000 miles warranty. 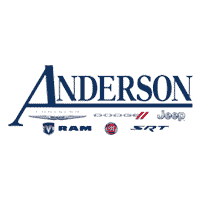 Terms and conditions of warranties vary by brand and vehicle, please see Anderson Chrysler for complete details. Warranties may be restricted or denied if your vehicle or part has been modified, improperly maintained or removed. WHY BUY FROM ANDERSON: All Anderson pre-owned vehicles include a one-year/15,000 mile (whichever occurs first) vehicle maintenance plan when the vehicle is serviced at an Anderson Auto Group dealership. Out of town customers will be accommodated with free shuttle service from Las Vegas and Phoenix airports and if an overnight stay is needed, discounted nightly rates are available from local hotels. We welcome you to come in and enjoy a positive buying experience and look forward to you joining the Anderson family of customers. DISCLAIMER: *Prices, options, specifications and images shown are subject to certain qualifications and availability. Pricing information is not final and may not include taxes, registration, finance and purchase fees. Please confirm vehicle availability, pricing and warranty information by calling us at 928-764-5153 or emailing our internet sales department at chryslersales@andersonauto.com. 19/30 City/Highway MPG, Sport Appearance Package with 20-inch black noise aluminum wheels, illuminated entry, cloth high-back bucket seats, satellite radio, Uconnect 4C with 8.4-inch display, steering wheel mounted audio controls, exterior rear parking camera, remote keyless entry and traction control. NEW VEHICLE WARRANTY: Every Chrysler, Dodge, Jeep and Ram vehicle purchase includes a 5-year/60,000-mile powertrain limited warranty and a 3-year or 36,000-mile basic limited warranty. Ram diesel trucks carry a 5–year or 100,000–mile powertrain limited warranty as well as the 3–year or 36,000–mile basic limited warranty. Fiat brand vehicles carry a basic and powertrain 4-year/50,000 miles warranty. Terms and conditions of warranties vary by brand and vehicle, please see Anderson Chrysler for complete details. Warranties may be restricted or denied if your vehicle or part has been modified, improperly maintained or removed. WHY BUY FROM ANDERSON: All Anderson pre-owned vehicles include a one-year/15,000 mile (whichever occurs first) vehicle maintenance plan when the vehicle is serviced at an Anderson Auto Group dealership. Out of town customers will be accommodated with free shuttle service from Las Vegas and Phoenix airports and if an overnight stay is needed, discounted nightly rates are available from local hotels. We welcome you to come in and enjoy a positive buying experience and look forward to you joining the Anderson family of customers. DISCLAIMER: *Prices, options, specifications and images shown are subject to certain qualifications and availability. Pricing information is not final and may not include taxes, registration, finance and purchase fees. Please confirm vehicle availability, pricing and warranty information by calling us at 928-764-5153 or emailing our internet sales department at chryslersales@andersonauto.com. Recent Arrival, 19/28 City/Highway MPG, S Appearance Package with leather-wrapped steering wheel and cloth bucket seats with "S" logo, 20-inch aluminum Black Noise wheels, power liftgate and sliding doors, premium fog lamps, 2nd-row and 3rd-row Stow 'n Go seats, 2nd-row window shades, satellite radio, Uconnect 4 with 7-inch display, overhead DVD video by Mopar, ParkView rear back up camera, ParkSense rear park assist with stop, blind-spot and cross-path detection and remote start system. NEW VEHICLE WARRANTY: Every Chrysler, Dodge, Jeep and Ram vehicle purchase includes a 5-year/60,000-mile powertrain limited warranty and a 3-year or 36,000-mile basic limited warranty. Ram diesel trucks carry a 5–year or 100,000–mile powertrain limited warranty as well as the 3–year or 36,000–mile basic limited warranty. Fiat brand vehicles carry a basic and powertrain 4-year/50,000 miles warranty. Terms and conditions of warranties vary by brand and vehicle, please see Anderson Chrysler for complete details. Warranties may be restricted or denied if your vehicle or part has been modified, improperly maintained or removed. WHY BUY FROM ANDERSON: All Anderson pre-owned vehicles include a one-year/15,000 mile (whichever occurs first) vehicle maintenance plan when the vehicle is serviced at an Anderson Auto Group dealership. Out of town customers will be accommodated with free shuttle service from Las Vegas and Phoenix airports and if an overnight stay is needed, discounted nightly rates are available from local hotels. We welcome you to come in and enjoy a positive buying experience and look forward to you joining the Anderson family of customers. DISCLAIMER: *Prices, options, specifications and images shown are subject to certain qualifications and availability. Pricing information is not final and may not include taxes, registration, finance and purchase fees. Please confirm vehicle availability, pricing and warranty information by calling us at 928-764-5153 or emailing our internet sales department at chryslersales@andersonauto.com. 19/28 City/Highway MPG, S Appearance Package with cloth bucket seats with "S" logo and leather-wrapped steering wheel, 20-inch aluminum "Black Noise" wheels, power sliding doors and liftgate, premium fog lamps, driver seat Auto Advance 'n Return, 2nd- and 3rd-row Stow 'n Go seats, 2nd-row window shades, satellite radio, Uconnect 4 with 7-inch display, Apple CarPlay and Google Android Auto, integrated voice command with Bluetooth, ParkView rear back up camera, ParkSense rear park assist with stop, blind-spot and cross-path detection and remote start system. NEW VEHICLE WARRANTY: Every Chrysler, Dodge, Jeep and Ram vehicle purchase includes a 5-year/60,000-mile powertrain limited warranty and a 3-year or 36,000-mile basic limited warranty. Ram diesel trucks carry a 5–year or 100,000–mile powertrain limited warranty as well as the 3–year or 36,000–mile basic limited warranty. Fiat brand vehicles carry a basic and powertrain 4-year/50,000 miles warranty. Terms and conditions of warranties vary by brand and vehicle, please see Anderson Chrysler for complete details. Warranties may be restricted or denied if your vehicle or part has been modified, improperly maintained or removed. WHY BUY FROM ANDERSON: All Anderson pre-owned vehicles include a one-year/15,000 mile (whichever occurs first) vehicle maintenance plan when the vehicle is serviced at an Anderson Auto Group dealership. Out of town customers will be accommodated with free shuttle service from Las Vegas and Phoenix airports and if an overnight stay is needed, discounted nightly rates are available from local hotels. We welcome you to come in and enjoy a positive buying experience and look forward to you joining the Anderson family of customers. DISCLAIMER: *Prices, options, specifications and images shown are subject to certain qualifications and availability. Pricing information is not final and may not include taxes, registration, finance and purchase fees. Please confirm vehicle availability, pricing and warranty information by calling us at 928-764-5153 or emailing our internet sales department at chryslersales@andersonauto.com.